It would be easy to exaggerate the importance of our win in Dundee as we are still in the opening stages of the season but the players can take heart from a fine performance that delivered our first league win. 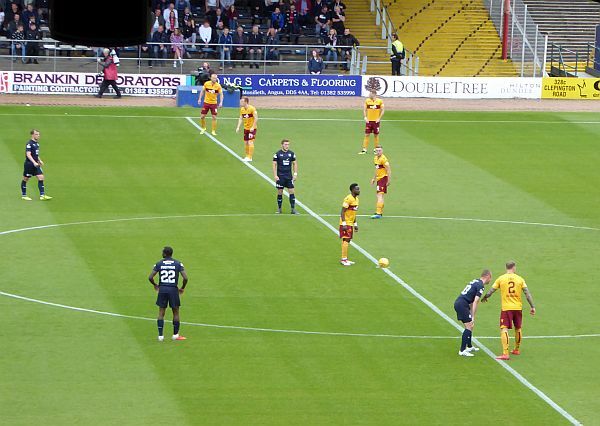 Dens Park has turned into a happy hunting ground for Motherwell - long may that continue. More than 500 made the trip from Lanarkshire and it was clear to them inside the first ten minutes that their favourites were in the mood. Indeed, there was some disappointment that we had not made the best of the many attacking opportunities we had before the break. But three goals in the second half sent us home happy. That's six goals in the last two outings from five different scorers, a nice way to share the spoils. We played well but the manger surely over-hyped the performance with his post match thoughts. "I'm very satisfied. I think the first half was the best performance since I came to the club 18 months ago.". The home defence will not enjoy replays of our first two goals but that will be of little concern to Johnson and Bigirimana as they took their chances. Campbell's strike four minutes from time followed Bigirimana's short free kick and Sammon's blocked shot but his strike produced a fitting climax to his 50th appearance in claret and amber. Dundee never looked like they had a chance of winning this game though they came close to an equaliser during their spirited five minutes after Kallman's goal. On Saturday's showing it is difficult to see how they can improve. Neil McCann's shoogly nail has almost fallen. We will have to wait until the middle of the month for the next fixture when Hearts visit on 15 September. We may have to score another three in that game if the league leaders are to be tamed. Motherwell win (again) in Dundee.